The potential of digital storytelling in cultural heritage has been widely recognized as an effective technique for communicating heritage interpretation to the public and increasing the understanding of the past and its implications for the present (Staiff, 2014). Digital storytelling seems to offer the capability to reach a wider, more engaged and returning audience (Brittain and Clack 2007). In previous research, initiatives like the EU funded projects CHESS (http://www.chessexperience.eu/) (Katifori et al, 2014) and EMOTIVE (https://www.emotiveproject.eu/) (Katifori et al, 2019), we have explored the potential of mobile digital storytelling and identified guidelines and best practices for the design and authoring of digital storytelling experiences at a heritage site (Roussou et al 2018, Perry et al 2017, Katifori et al., 2018). In this paper, we apply this work for the design of a digital storytelling experience in the Criminology Museum of the University of Athens. The collections of the museum fall under the definition of “dark heritage,” as defined in the next section of the paper, featuring a variety of crime-scene evidence, including weapons and even human remains. Part of the literature around dark tourism and heritage seems to emphasize a fascination with death as the main (and even sole) motive for visiting sites in which death is presented (Stone & Sharpley, 2008). The more morbid aspects of the Criminology Museum would at first glance seem to be ideal for a storytelling-based approach that would ensure visitors’ emotional engagement and fascination. However, a closer study of the museum history, current practice and objectives, as well as a comprehensive visitor study revealed that a difference approach would be better suited for this particular site. In this work, we report on how we created a thought-provoking digital storytelling experience for the museum. Following a user-centered design methodology, we discerned that the motivation of the museum audience was not only to have an encounter with crime and death, but also to better understand and reflect upon the darker sides of human nature. Then, borrowing from education, we used the notion of “essential questions” as tools to stimulate thought, to provoke inquiry, and lead to a deeper understanding of how the world and human nature work (Jacobs, 1997) with the objective to develop an interactive digital storytelling experience for the museum. In the following section, we refer to the the concept of “dark heritage” and then present the Criminology Museum as a dark-heritage site, followed by the findings of the visitor study we performed in the museum. Next, we focus on the concept of “essential questions” and their application in heritage, before going into the details on how we applied it in our digital storytelling experience. We conclude the work with our insight on guidelines for sites with similar characteristics as well as addressing open issues and challenges for the application of digital storytelling in dark heritage contexts. Dark tourism (also referred to “black tourism” or “grief tourism”) has been defined as tourism involving travel to places historically associated with death and tragedy (Foley & Lennon, 1996)—some of them managed as entertainment venues and others with more focus on a historical- and heritage-related approach. The term “dark heritage” has been applied to both sites and artifacts, along with terms like “difficult heritage” and “dissonant heritage.” More specifically, dark cultural heritage can be defined as “cultural heritage that is associated with real and commodified sites of atrocity, death, disaster, human depravity, tragedy, human suffering, and sites of barbarism and genocide”(Kuznik, 2018). Although dark heritage is relatively new as a term, the concept coincides with possibly one of the oldest types of tourism, as there is an innate human inquisitiveness and touristic attraction to places of death and horror (including popular public events of the past, such as public hangings, beheadings, the burning of witches, gladiatorial games, etc. (Kuznik, 2018). There is a clear and identified tendency in the heritage sector to capitalize on the “product of dark tourism” and in a sense “milk the macabre,” (Dann, 1994) taking advantage of its willing consumption by the “dark tourist.” As suggested by Stone (2005), “within contemporary society, people regularly consume death and suffering in touristic form, seemingly in the guise of education and/or entertainment,” and sometimes tact and taste do not “prevail over economic considerations.” However, without the tourist demand, there would be no need to supply it. A large part of dark tourism and heritage literature seems to emphasize this fascination with death as the main (and even sole) motive for visiting sites in which death is presented (Stone & Sharpley, 2008). This perspective is sometimes adopted in virtual storytelling experiences for dark heritage sites, and the ethical aspects of such approaches have been discussed in Fisher & Schoemann (2018). However, according to Biran et al., (2011) motives vary and include a desire to learn and understand the history presented and an interest in having an emotional heritage experience. (Rami and Erdinç, 2013). In the end, the motivation behind exhibiting these sites is what partially dictates whether they are exploitative or not. In the next section, we attempt to clarify where the Criminology Museum stands in this respect. The Athens University Criminology Museum (http://www.criminology-museum.uoa.gr/) was founded in 1932, and since 1992, it has been housed within the Laboratory of Forensics and Toxicology of the Athens University Faculty of Medicine. Its collections are related to toxicology, criminology, forensic medicine, and weapons and present the history of crime in Greece in the 19th and 20th centuries. 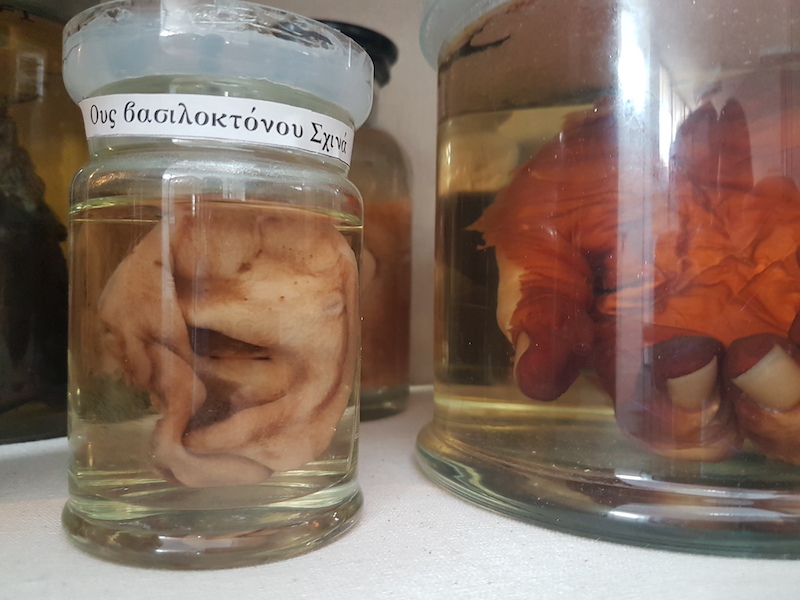 This is probably one of the most peculiar and special museums in Athens, more akin to the “curiosity rooms” of the 16th century, interestingly—not housed inside an amusement park but rather in the heart of an academic institution. 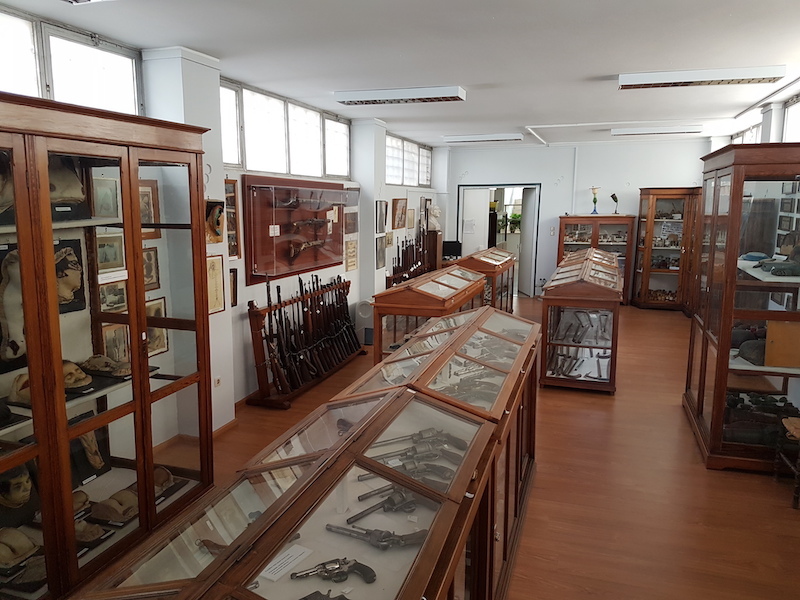 The museum is not open to the public daily and, until recently, operated only by appointment for special interest groups, such as students and specific organizations with an interest in arms or crime and forensics, gradually the wider public to visit. The museum opens one day per year to the public. The great number of visitors on this open day makes it evident that digital access to the museum collections should be made available to cater to this demand, to meet the needs of the audience while fulfilling the museum’s purpose of communicating heritage (Koutsis, 2019). Visiting the museum can definitely be classified as a “dark heritage” experience. The collections cover different aspects of crime; however, death is a prominent and shocking theme. The human remains collection contains mummified heads of 19th-century bandits, remains preserved in glass jars and even a full-body mummy, whereas the wax models of the effects on the human body of different methods of murder, like gunshots to the head and actual crime-scene photos, add a strong emotional effect. All of these strange exhibits are displayed without any intent to shock or capitalize on the macabre. They are naturally displayed as objects that have served their scientific or investigatory purpose and are now in waiting to be used again by young scientists and investigators in the context of their education—much like what one would expect of an evidence storage room in older times. This impression is consistent and confirmed by the history of the museum. The founder and person responsible for the core of the collections was a professor of Forensic Medicine, Ioannis Georgiades (1874 – 1960). Georgiades was a gun enthusiast, avid collector of crime scene evidence and Olympic Fencing medallist in the 1886 Athens games as well as a dedicated researcher and philanthropist. It may seem strange that one person can combine such seemingly conflicting qualities. It is a given that studies of human nature, acting for good and evil, have been performed through Philosophy and Metaphysics. However, as science and technology are now able to provide a better understanding of these intriguing questions, experts in Forensics and Criminology are now called to give new answers about how accidents or crimes happen, identifying the reasons and sometimes the motives for the crime. This is why behind the exhibits, there is a hidden story—one that the first-time visitor can feel but not immediately realize, and that is the scientific research work of the Laboratory of Forensics and Toxicology. The peculiar circumstances in which the evidence was produced and the specific context of the object acquisitions may easily explain the highly engaging quality of the permanent exhibition. However, this quality remains like a “dormant advantage” as there is a strong awareness among the Board members (who also serve as guides when tours are programmed) that shocking material is not to be blatantly exposed to the general public. The overall result is the emphasis on academic presentation, leaving the human stories behind the exhibits silent, mostly due to the limited time of the guided tours and to a shortage of personnel. The above scientific approach, consistent with the founder’s vision, seems to be a conscious direction for the museum, ensuring a clear decision for fostering historical understanding and institutional education, without directly responding to the present fascination for the macabre. As the Criminology Museum is accessible to the public only by appointment, the best way to study the type of audiences the museum would attract, if open, was to conduct a visitor study during the university museums’ Open Day event. This event takes place once a year. Only then, everybody is given the chance to visit all the Athens University museums, even those regularly closed to the public. They may choose to participate in guided tours or attend special events. The visitor study was conducted on Saturday, October 7, 2017, 11:00am—3:00pm. During this time, the museum received 300 visitors who accessed the museum in groups of 30-45 and participated in a guided tour by one member of the museum staff. Of those, 137 were briefly interviewed at the end of their visit. In parallel, members of our team observed the visitors throughout the tour and tracked preferences in regard to visitor trajectories and time spent in the museum gallery after the end of the guided tour. For the needs of this work, we focus on the results of the study, which are relevant to the visit characteristics and the visitors’ preferences and needs. Based on the evaluation team’s informal observations, most of the visitors lingered on even after the end of the guided tour to view the collections themselves, focusing on the ones that caught their attention most. In this sense, the mean-visit duration was closer to 45 minutes to 1 hour, significantly more than the expected 20—30 minutes of the guided tour. During the visit, the guided-tour participants seemed focused on the guide, and they were not discouraged, even by the ample use of scientific terminology by the experts. They listened to the interpretative information with interest, and then in their own time, they followed their personal paths of discovery of the exhibits. This positive view of the museum is confirmed by the interviews as 86% confirmed that their expectations were met, and about 20% were very enthusiastic and commented on the “uniqueness” of the museum. 47% reported that they liked “all the collections.” 41% liked the guided tour, and 27% liked the forensic medicine collection, with special mentions to the embryos, the mummy, the human remains and the bandits’ mummified heads. There were also references to other exhibits like the guillotine, the firearms, the letters of the mentally ill, material related to the occult, the toxicology exhibits, etc. A low 12% of the visitors reported that they were “partly satisfied” by the visit, whereas only three visitors said they were not satisfied at all. As to the reasons they were not satisfied by the visit, the majority (31%) reported the “small space.” 8.7% felt the time allocated to them for the visit was too little. 30% referred to issues related to the museological design and presentation of the collections, including the lack of more detailed information on specific exhibits and the fact the museum is not open to the public daily. Only a very small percentage referred to the shocking nature of some of the exhibits, like the embryos. On the whole, the visitors expressed the wish that newer exhibits should be added to the collections and that the museum would benefit from a more modern approach in their presentation. Few reported the use of technological means as a necessity, whereas they felt that a communicative and friendly expert guide, like those met in the museum, always make the visit more pleasant. They saw the guide as a reliable source of anecdotal stories and of unique perspectives— somebody who is not a mere narrator of facts about the objects but an efficient communicator who enables discovery of the human aspects behind the real stories. So, what makes the visitor experience so successful for almost all visitors in this museum, even though there was very limited and antiquated exhibition space and minimal interpretative material available? Was it the dark and shocking nature of the exhibits that made this difference? The visitor study revealed the opposite. Although some of the visitors were, in fact, drawn to the museum because it was “different,” its darker nature was not what made visitor engagement much longer than the allocated time. What seemed, in fact, to do the trick was the interaction with the criminal science experts and their “insider” scientific information, as well as the human stories they brought to life: stories of crime, yes, but more importantly, stories that revealed different aspects of human nature and provoked a deeper type of reflection. However, even though a digital app was not explicitly requested by the visitors, it was requested by the staff, who felt that they are not able to cover this strong demand for guided tours in the museum, due to their other research and investigatory duties in the Laboratory of Forensics and Toxicology. It is a fact that a digital app cannot replace the expert, but can it be designed in such a way that it stays true to the guided tour’s more successful qualities? The next section presents “essential questions” as a design tool to this end. The traditional assumption when designing museum exhibitions and informational content for cultural sites is that the visitor comes to the site with an appetite for information. Cultural institutions attempt to satisfy this appetite through traditional informational labels and audio guides or even more elaborate, multimedia approaches—all designed to offer to the visitor general information. However, a more realistic assumption would be that most visitors do not enter a site with any pre-existing knowledge of its themes and specifics, in some cases brought there as part of a group or through touristic curiosity. In many cases, they are drawn to the site as a “must-see” destination—in our case more of a “curiosity,” or even a way to spend some relaxing time when visiting a new place. Frequently, although they have an interest in the site, they do not truly and deeply understand or even care for its themes and topics. Once there, and especially when an obvious source of awe is lacking, they feel unsure as to what is there to care about and absentmindedly but diligently are going from exhibit to exhibit and from label to label, or just wandering around looking for something to attract their interest. This section discusses “essential questions” as a proposed first step to design for the visitor’s initial engagement. A first step toward designing for engagement can be the identification of the “interesting” and “relatable” aspects of a site. Toward this direction, we utilise the notion of “essential questions,” a technique used in education to provoke self reflection and constructive dialogue among students in a formal education, classroom setting. Essential questions are defined as “essential” in the sense of signalling genuine, important and necessarily-ongoing inquiries, “questions that are not answerable with finality in a brief sentence . . . Their aim is to stimulate thought, to provoke inquiry, and to spark more questions” (Wiggins and McTighe, 2005). What motives could lead a person to take up arms? What reasons would lead someone to take their own life? Should the state have the power to enforce the death penalty? What is the role of illegal substances in the society? Why do people turn to magic to solve their problems? What is the role of chance in our lives? What is the role and application of scientific research in our everyday lives and in criminal investigation in particular? In the next section we focus on how the concept of essential questions informed the design of a digital storytelling experience for the museum. The overall concept and design of a digital storytelling app for the Criminology Museum was iteratively realized by two expert museologists from our group. The concept and design were, in fact, grounded on the feedback received by the museum curators and collaborating experts (after several interviews), the visitor study and observations during the Open Day, and the detailed study of the material presented by the experts during the guided tours. A 15-minute interactive digital storytelling experience, with the title “Following the mysterious evidence,” where the user becomes a criminal investigator of the early-20th century, with the objective to introduce criminal investigatory practice before the museum tour starts and set the visitor’s mood. A 20-minutes to 1.5-hour narrative, under the title “The exhibits tell their stories,” in which the visitor, while looking at the museum exhibition cases, can select individual stories of specific objects and how they relate to wider questions about human nature. The interactive digital storytelling experience allows the user to experience a story and make decisions within the mobile storytelling app through the eyes of a criminal investigator from the beginning of the 20th century. A crime has been committed inside a house, and the user is called to the location to examine the crime scene and speak with witnesses, and then examine evidence with colleagues back at the police station. This is a brief, 15-minute storytelling experience, designed to introduce different types of evidence that the visitor will later encounter in the museum and describe how they are studied and used during the criminal investigation. What is the role of the exhibit in criminal science? Anecdotal stories about the exhibit. General reflections for the essential questions related to the collection and particular exhibit. The visitors can select and listen to as many of these narratives as they wish and then move back to the main menu and select a different collection. This modular approach to the material can accommodate a visit planned to last from 20 minutes to 1.5 hours. To create and deliver the aforementioned experiences, we used the Narralive software tools also employed within the EMOTIVE project (Katifori et al., 2019). The experiences were created through the use of the Storyboard Editor, an authoring tool for interactive digital storytelling targeted to authors with minimal-to-no technical expertise. Using the convention of the storyboard, this tool enables creators to organise their content and create interactive activities using predefined templates that were designed based on previous research in digital heritage experiences (Roussou & Katifori, 2018). After creating an experience, it becomes available to the museum’s visitors through the dedicated mobile application. The Storyboard Editor is a client-side web application created with AngularJS in its core. The data produced in the tool are stored into a CouchDB database where they become available to our mobile application. 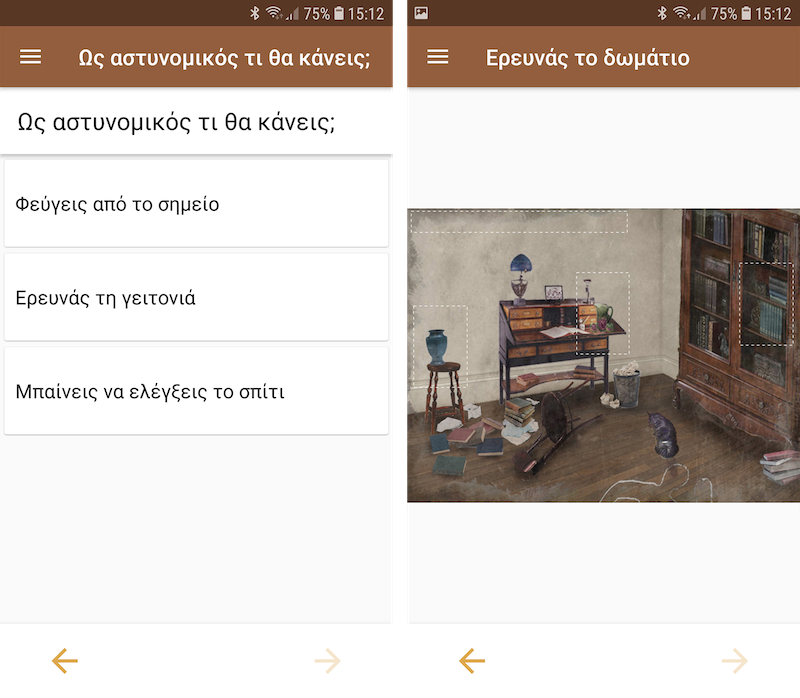 The mobile application created for the museum is based on the Narralive mobile application that supports the delivery of experiences created from the Storyboard Editor to the museum’s visitors. The app is designed in a way that allows us to customize it for a specific museum, as we did in this particular case. Through the use predefined templates, the mobile application is able to present static or interactive activities to the visitors, based on the author’s choices. The provided activities vary from simple pages with image and text, to quizzes, exhibit exploration, character dialogue or questions directed to the users (see figure 6). Additionally, the experience may follow different paths, if the author chooses to add branches into the narrative. Then the visitor may see menus like the ones presented in figure 7. The mobile app is available for devices based on Android v4.1 (API 16) and later. It was developed with Android Studio and utilises Android Flavors to enable easy UI customisation based on the museum’s needs. Another tool, the Floor Plan Editor, was used to create a virtual representation of the museum on the Internet, using 360-degree pictures. This will allow us to run further evaluations of the experience with remote users, but it will also enable interested parties to explore the museum from their homes, given that it is closed to the public throughout the year. This is a web application created with AngularJS, and the created content is also stored in the aforementioned CouchDB database. The resulting virtual museum is also available through a web browser. The resulting digital storytelling experiences have been adapted so as to be tested and evaluated, both on-site and online. We evaluated the efficacy of these different versions to explore their potential for making the museum accessible virtually as well as promoting visitor engagement while visiting the museum, without the need of a human guide. The app has been undergoing an iterative formative evaluation process. The feedback received through the user evaluation is taken into account to improve the structure and production of the content as well as inform other aspects of the app, like the navigational cues leading to the exhibits. Fourteen users have tested the app so far, and the feedback on the content has been very positive. Most issues reported were more relevant to the structure of the content as well as the need for navigation cues to the exhibits, which are not so easy to locate in many cases. An interesting observation, to be confirmed with further evaluation activities, is that some users when first entering the gallery felt restricted to focus immediately on the app and follow even its very loose guided structure of providing narrative material, per collection and object. Especially those younger in age felt eager to roam freely around the gallery, examine the strangest items, and comment and discuss with the people in their party. After this initial exploration, they felt more inclined to use the app to find out more and make more informed decisions about what they wanted to hear. We consolidate and discuss our findings and insights from the design process of this experience in the following section. In recent years, given that information is offered through the Web, in a fast-paced, visual and interactive way, it has become harder and harder to engage visitors with a site through traditional, non-digital and non-interactive exhibition approaches (Graham, 2018). This fact makes enhancing and promoting the macabre within a dark cultural heritage context all the more appealing as a solution to engage audiences. In this sense, it is more and more crucial to find ways to initially engage the visitors in the context of the site, to find themes that are relatable to them and their personal experiences, to excite their curiosity. Then, once their interest is caught, they will actively seek information themselves, to answer questions that they have on the site and its historical context. Designing the visitor experience based on the concept of one or more essential questions may have several benefits. The essential questions go beyond exhibit-centric information and frame all interpretation in the service of a higher, more important objective that feels more relatable to the visitors, thus offering a reason to truly care for the interpretation. The underlying essential question can make the experience meaningful and engaging and provoke discussion and interaction between users who visit the site together. Starting with a specific essential question can inform the experience concept and scenario. It gives the museum curator and experience designer a clear objective as to which direction the experience should follow and what would be its general concept. In the case of the Criminology Museum, the concept of how scientific research informed criminal investigatory practice led to the concept of the introductory interactive storytelling app where the user becomes a criminal investigator of the past. With the essential question as a guide, the experience designer may inform the selection of particular exhibits to include. In the aforementioned example, a variety of exhibits was selected to frame criminal investigation evidence within their “natural” context, a crime scene. Sparking the interest of the visitor through an experience designed to address an essential question is one possible use of the concept. Essential questions can also be built more directly into the experiences, promoting reflection or fostering meaningful dialogue between visitors. As it has been demonstrated also in our previous work, social interaction and dialogue in a cultural heritage context can significantly enhance the visitor experience and cultivate historical empathy (Perry et al., 2019). The aforementioned advantages of an essential questions-based approach indeed apply to any cultural heritage site. However, in the case of a dark heritage site, they offer a strong and viable alternative to taking advantage of the more macabre and shocking aspects of the site to promote engagement. 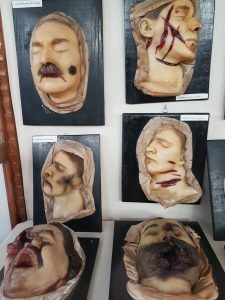 As is the case with the Criminology Museum, in all such sites of death and horror, the macabre is there, intensely present, and it is bound to attract the visitor’s attention like a magnet. Structuring a digital experience around the more general conceptual issues of human nature, however, can promote a deeper understanding and meaning making and lead to a more profound experience for visitors than the easily accomplished, strong emotional response to a horror site. In this paper, we explore the potential of an essential questions-inspired digital storytelling experience in a dark heritage setting. Following a user-centered design methodology, we developed a two-part digital storytelling experience for the Criminology Museum of the University of Athens. We combined a brief interactive storytelling experience to introduce criminal investigation practices in the beginning of the 20th century to be experienced before the visit, with a selection of individual object stories to be experienced within the visit. Through iterative design and evaluation, we examine the effectiveness of our approach. Although the evaluation is still on-going and our results not yet conclusive, our findings so far are promising. Informing a digital experience with the notion of essential questions seems to contribute to a meaningful and engaging experience and is more bound to provoke reflection, discussion, and interaction between users who visit the site together. We continue to research this approach in the Criminology Museum as an ideal setting. Are there really more “essential” questions than those related to death and human nature? We would like to thank the Criminology Museum staff and collaborating experts Dr. Maria Stefanidou-Loutsidou, Dr. Constantinos Moraitis, Dr. Zoe Sakki and Dr. Sotiris Athanasellis for their collaboration for this work. This work has been partly funded by EMOTIVE. EMOTIVE has received funding from the Horizon 2020 EU Framework Programme for Research and innovation under grant agreement n° 727188. Biran, A., Poria, Y. & Oren, G. (2011). “Sought Experiences at Dark Heritage Sites.” Annals of Tourism Research 38(3), 820–841. Brittain, M. & Clack, T. (2007). “Introduction.” In T. Clack and M. Brittain (eds. ).” Archaeology and the Media. Walnut Creek: Left Coast Press, 11-66. Coote, D. (2009). “Exploitation or healthy interest? An analysis of dark tourism.” Jeju Weekly. Consulted January 10, 2019. Available at: http://www.jejuweekly.com/news/articleView.html?idxno=776. Dann, G. (1994). “Tourism the nostalgia industry of the future.” In W. Theobald(ed.). Global Tourism: The Next Decade. Oxford: Butterworth Heinemann, 55–67. Katifori, A., Karvounis, M., Kourtis, V., Perry, S., Roussou, M. & Ioannidis, Y. (2018). “Applying true interactive storytelling in cultural heritage – Opportunities, challenges and lessons learnt,” ICIDS 2018, Dublin. Katifori, Α., Roussou, Μ., Perry, S., Drettakis, G,. Vizcay, S., Philip, J. (2019). “The EMOTIVE Project – Emotive Virtual Cultural Experiences through Personalized Storytelling,” CIRA@EuroMed 2018, 11-20. Jacobs, H. (1997). “Refining the map through essential questions.” Mapping the Big Picture: Integrating Curriculum & Assessment K-12. Alexandria, VA: ASCD (Association for Supervision and Curriculum Development), 25-33. Roussou, M., Pujol, L., Katifori, A., Chrysanthi, A., Perry, S., & Vayanou, M. (2015). “The museum as digital storyteller: Collaborative participatory creation of interactive digital experiences.” Museums and the Web, Selected papers from Museums and the Web, 2015. Staiff, R. (2014). “Re-Imagining Heritage Interpretation: Enchanted the Past-Future.” London: Routledge. Stone, P. (2005). “Dark Tourism Consumption–A call for research.” E-Review of Tourism Research 2(5), 109–117. Stone, P. & Sharpley, R. (2008). “Consuming dark tourism: A thanatological perspective.” Annals of Tourism Research 35(2), 574-595. Katifori, Akrivi, Restrepo Lopez, Klaoudia Marsella, Petousi, Dimitra, Karvounis, Manos, Kourtis, Vassilis, Roussou, Maria and Ioannidis, Yannis. "Approaching “Dark Heritage” Through Essential Questions: An Interactive Digital Storytelling Museum Experience." MW19: MW 2019. Published January 13, 2019. Consulted .